The purpose of FIUDI was to offer a technologically innovative product, and this has led the company to opt for titanium, a material normally employed in the aircraft industry due to its outstanding mechanical features combined with low weight. The FIUDI milling cutter project gives top priority to the active safety of all the components fitted to the body itself, thus minimizing the risk of components being thrown out. The balancing weights are incorporated into the body and are not affected by the centrifugal force that might release them off the milling cutter. The cartridge contour is such that radial projection will be prevented event if the cartridges are not secured unintentionally. The securing wedges (adjustable by the thousandth) feature a mechanical radial stop that allows the milling body to be disengaged only after the cartridge has been fully released by being taken out axially. 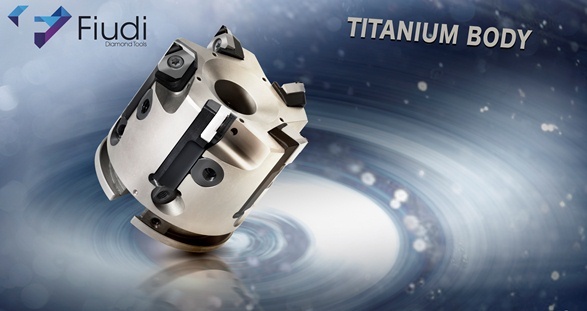 The titanium body gives the milling cutter and its components high stability, which allow feeds to the cutting edge up to a maximum chip section of 0.40mm regardless depth pass. Note: It is strictly forbidden to operate beyond the maximum limits stated and marked on the milling cutter itself. The FIUDI milling cutter range may be equipped, without distinction, with mono-crystal diamond inserts (SY-NAT) as well as polycrystalline diamond (PCD) and cube boron nitride (CBN) inserts, without having to replace any component. The milling cutter may also be configured in accordance with the specific customer’s needs. Moreover, it may be preset and balanced, and the configuration itself may be modified at any time when the production needs change.